Have you ever suffered the travesty that is a dry, tasteless chicken breast? Or tried to cut into a pork chop, only to be rewarded with a bicep workout and a rumbling stomach? Or chewed your way through a turkey that tastes like it might’ve been made out of sand? We have, too. It was unpleasant. Thankfully, it never has to happen again — just harness the power of science, and you can brine your way to consistently better meat. Here’s why it works — and how to use its potential for good. Brining was originally used for food preservation in the pre-refrigeration era. 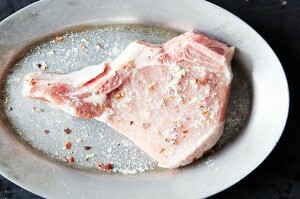 However, there are two solid reasons why you should brine your meat in this century: flavor and texture. Brining infuses the meat with savory, finger-licking’ flavors, all while tenderizing it to butter-soft texture. 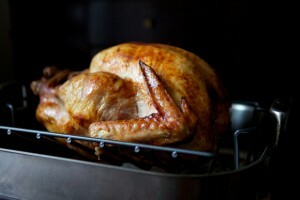 Tha nks to the dry brine, this genius turkey comes out juicy and crisp every time. While you brine, your meat is not only gaining liquid; it’s also gaining salt, and the higher salt concentration will begin to break down its proteins. Think of the proteins in meat as tight, stubborn coils — then salt comes along, gives them a deep tissue massage, and they begin to relax. This yields a meat with a more tender mouth feel and reduced chewiness. Kenji Alt-Lopez of Serious Eats sums it up perfectly: less tightening = less moisture loss = juicier meat. Brining is the secret to the ultimate fried chicken. Some meats benefit from brining more than others. Drier, leaner meats are at the top of the list, as they don’t have as much fat to contribute moisture and flavor. Poultry breasts, pork chops, shrimp, and that infamous Thanksgiving turkey are all good candidates for brining. As barbecue season draws near, racks of ribs are also begging for a briny dip, which will help them retain moisture through a long smoke. Before purchasing a piece of meat to brine, check the label to make sure it hasn’t already been injected with a salty solution. 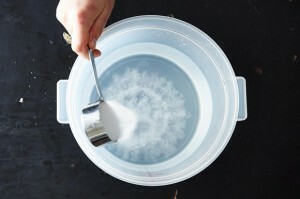 The basic ratio for any wet brine is 1 cup of salt to 1 gallon of water. 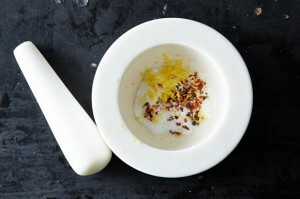 If you’re feeling fancy, throw in some smashed garlic cloves, peppercorns, or citrus — also smashed. Another general rule of thumb is to leave your meat in its brine for roughly one hour per pound — never brine your meat more than the prescribed amount, lest the proteins break down too far, turning it into unappetizing mush. Pro tip: If your meat has skin on it, pat it dry a few hours before cooking time, then leave it in the fridge, uncovered. 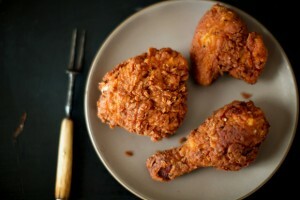 It will end up juicy and tender, with shatteringly crisp skin. Dry brining is technically a misnomer. The term “brining” implies a liquid, and dry brining could more accurately be categorized as a rub, or a “cure,” for your meat. However, the end result is quite similar. By coating your meat in a salty mixture, it both re-distributes moisture and pulls the seasoning deep into the meat. 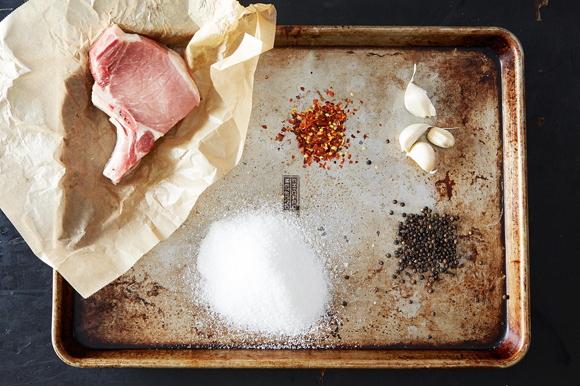 Dry brining is also a clean, simple seasoning option if you don’t want to fill your fridge with large containers of submerged meats, for some reason. General dry brining technique calls for 1/2 teaspoon of kosher salt per pound of meat, plus whatever other (dried) herbs and spices you so choose. Pummel everything into a sandy texture with a mortar and pestle, then rub it onto your meaty canvas. Place the meat in a Ziploc bag and refrigerate 1 to 2 days (though if you’re in a rush, just leave it in for as long as possible). Pro tip: Adding a pinch or two of sugar to your dry brine will help the meat caramelize as it cooks. To avoid scary bacteria, always brine in the fridge. For the same reason, make sure none of your meat is exposed to the air. Always let your meat come to room temperature before cooking.